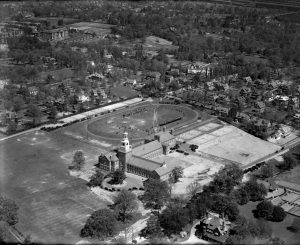 This aerial view of William Penn Charter School, taken c. 1925-26 by the Aero Service Corporation, shows the school’s main building, as well as athletic fields and surrounding residences. The co-educational Quaker school was established in 1689 by Pennsylvania founder William Penn. Penn wanted his school to prepare the young students to be teachers, merchants, builders, and farmers, but also political and professional leaders. Penn wanted poor children to be able to attend the school for free, and as early as 1697 the Overseers established a fund to make this possible. 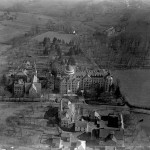 The school was among the first to offer education to different religions, financial aid, education for girls, and education for people of all races. The school moved to the location shown in the photograph, on School House Lane in the East Falls area, in 1920. 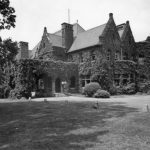 Originally a downtown urban school, Penn Charter made the move to accommodate the differing academic and athletic needs of a growing student body from a region stretching from west and north of Philadelphia into New Jersey. Posted by Charlene Mires on March 1, 2018 at 4:24 pm. Bookmark the permalink. Follow any comments here with the RSS feed for this post. Trackbacks are closed, but you can post a comment.